A lynx is any of the four species within the wild cat genus Lynx. These species are the Canada lynx, the Iberian lynx, the Eurasian lynx and the bobcat. The names of the first three give us a clear indication of their geographic range and bobcats (Lynx rufus) are found across most of the contiguous United States. Like all other animals in the felidae family (which includes tigers, lions, pumas, leapords and cheetahs), lynxes are carnivores. When looking for physical characteristics which distinguish lynxes from other members of the felidae family, there are a few things to look out for. Members of the Lynx genus have a telltale sign which is very easy to spot: the ears. 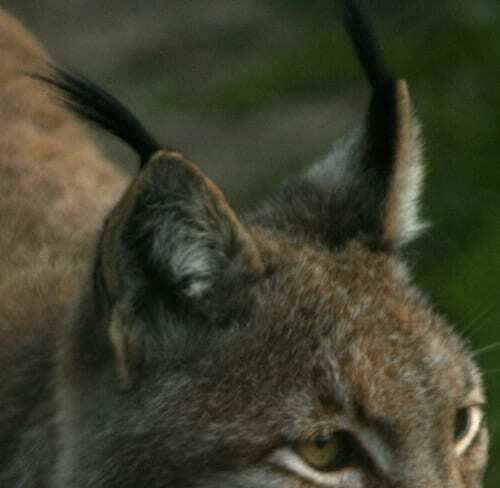 As the picture below shows, lynxes have tufts of black hair on the tips of their ears. The good news is this makes them very easy to recognise for anyone lucky enough the see them in the wild, the bad news is nobody can agree on what they’re used for! According to the National Geographic these tufts of hair enhance hearing for hunting, whereas others believe they are used for detecting things above their head. We can be sure however that all lynxes posses these tufts and no other species of cat do. They also possess another physical characteristic which is a bit more difficult to spot. All species of lynx have large paws relative to the size of their bodies. 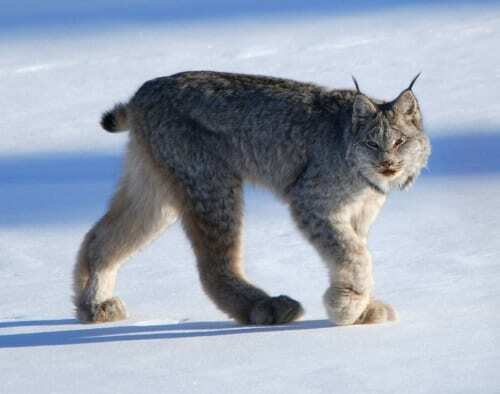 The Canadian lynx (Lynx canadensis) for example have huge paws with thick fur to keep their toes warm in the winter. This adaptation means they are essentially wearing snow shoes, allowing them to traverse long distances at speed without sinking in the snow. All lynxes have padding on the soles of their paws which helps them sneak up on prey, however the size varies depending on the speices. As ambush predators they very rarely chase down a meal, meaning the ability to sneak up on their prey is central to their survival. An investigation conducted by the Grant Museum team uncovered signs that our lynx skull may have been hunted and shot prior to its entry into UCL’s Collections. 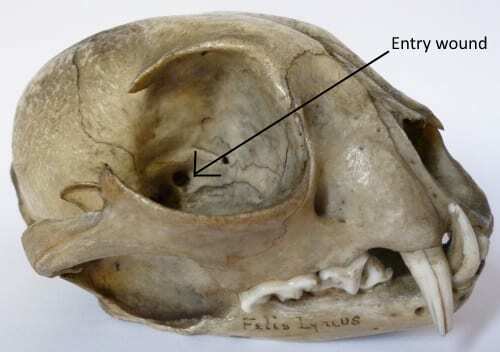 As the pictures below demonstrate, there is evidence of an entry and exit wound on the right and left side of the lynx’s skull, respectively. Information on our database supports the idea that this specimen could have been shot. Our records indicate that this particular specimen was accessioned to the museum in 1890, meaning it has been in the museum for 128 years at least, possibly much longer. 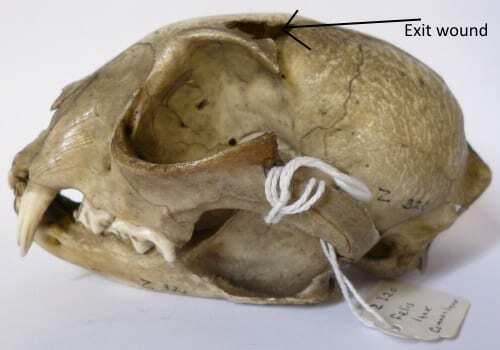 In the nineteenth century it was common practice for museums to hire hunters to collect specimens for them, and the damage we can see on this lynx skull suggests this could well have been the case for our unfortunate feline friend. It’s always nice to end our blog on a positive note, even nicer when it’s positive news related to the UK. The good news for all feline lovers out there is that lynxes could be coming back to the UK after a lengthy absence! In July 2017 the Lynx UK Trust submitted a plan to reintroduce lynxes into the wild in the UK, 1,300 years after they became extinct in this country. Although there was some backlash from the Northumberland Wildlife Trust, the reintroduction is scheduled to occur in the next year. If it does go ahead, we may see lynxes in the UK very soon!